Happy New Year from the KSU Wesley Foundation! We had a wonderful Fall semester here in Kennesaw! Wesley kicked off the year with several orientations over the summer, during which we had the opportunity to talk to new students and invite them to our services. Our Wednesday night services were well-attended this semester, with an average of 45-50 students worshiping and learning with us every week. This attendance is up more than twice from last year! After every service, small groups meet to discuss the message and pray for one another. Those groups are thriving with an average of 25 students (mostly freshmen) per week. Wesley also has an amazing leadership team of 20 upperclassmen students who lead our small groups and help our ministry run the best it possibly can! Wesley hosted two retreats this Fall - one to specifically equip our leadership students for the year, and one for all our students. Our leadership retreat was held at the North Georgia Wesley Foundation house. This setting provided our students the space we needed for the weekend, and the opportunity to interact with Wesley students from Dahlonega. We focused on building community within our leadership team and preparing our leaders to be discipled and to help lead the ministry this year. All 20 of our leadership students are discipled, or mentored, by a member of our staff. This gives each student the opportunity to grow in a one-on-one setting with their discipler on a weekly basis. As a staff, we believe that discipleship helps leaders maintain healthy relationships with others, as well as strengthens their relationship with the Lord. ..
Our Fall student retreat gave our body time to rest together as a community. Almost 40 students came on the retreat, and we saw breakthrough come to several students who had been struggling with serious issues for years. It was a healing weekend for many, and a chance to seek the Lord for all! 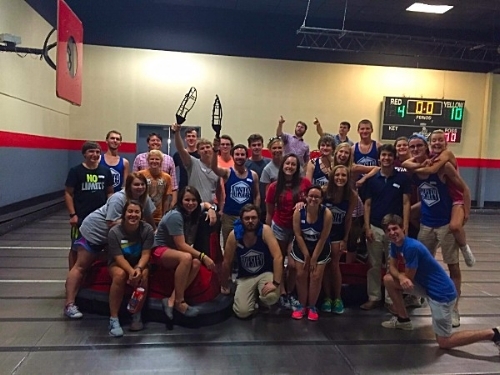 In addition to our retreats, we reached out to KSU students with social nights, one of which was a WhirlyBall and lasertag night. Forty students came out to celebrate the beginning of the semester with some friendly competition, making this one of our largest social events yet! Most recently, we celebrated Christmas together with a service that included carols, cookie decorating, a Christmas market, and a gift swap. It was a little crazy with such a large group, but we sent the students into finals and the break with a night of fun! As we look towards the spring semester, we have some exciting things on the horizon. Wesley will take a mission trip to Memphis during KSU's spring break in April. This will be our second time in Memphis, and we will be working with Serve901, an organization that seeks to bring racial reconciliation to the area, and directs visiting groups to meaningful projects throughout the city. We will begin the application process for our 2016-2017 leadership team, and our leadership opportunities will encompass more ministry areas than ever before. Wesley will also seek out greater outreach opportunities in Kennesaw as we take hold of all that God has for our campus! We hope that you enjoyed this inaugural newsletter from the KSU Wesley Foundation. We look forward to sending you quarterly newsletter updates throughout the year. Please let us know if you have any questions or would like more information! We would love to hear from you. You can contact us by email atksuwesley@gmail.com or check out our website atksuwesley.org. Also, if you have the contact information of other alumni who would enjoy receiving this newsletter, please forward this email or fill out this short form on their behalf. Thank you for all your support, and we at KSU Wesley hope that you have a blessed New Year! Grabbing some Steak n Shake after Wesley!